This year we went to SPEZI much later than in previous years. I formerly argued that the time to go was early on Saturday morning as most other people would be out shopping. It turns out that the busiest times at the ticket offices were early on Saturday, when visitors could wait up to an hour to get in. Visitors then hit the halls to see what was new or chat to the companies who had sold them the trike, the trailer or the folding bike to find out how to save an ounce or two, to buy mechanical or electrical or electronic components to build the dream e-power sociable or maybe to sell their idea to someone with some money. It's that kind of show. Enthusiasts and freaks talk to the enthusiasts manning the stands. The halls were full and getting to the most popular stands was like trying to weave one's way through the crowd to get a beer in a stadium at half time when Bayern München plays Real Madrid. This year we could only get to the exhibition by Sunday afternoon at 14:00 (2pm). There were plenty of visitors as we made our way through the street around the halls. This area is blocked off to motorised traffic and so is used as an informal test track and exhibition area by the stands on the external exhibition area. It was a sunny day and the ice cream and dutch frites stand were doing great business judging by the queues. Hall 3 was full of visitors but it is a small hall with some big stands and so there was not much space for the humankind in the aisles. We chatted to the editor of "Fahrradzukunft - Bicycle Future" a German language e-magazine which can also be obtained in print form. We are looking for an author or publisher competent in English to take over some or all of Bergstrasse Bike Books, our cyclist touring guides. 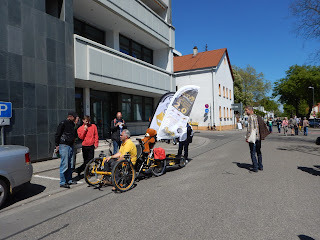 We returned to the informal test track outside and dodged the test pilots some of whom had more enthusiasm than caution to go to Halls 1 and 2 which is where most of the major players in the recumbent trike and e-bike business hang out. These halls had fair number of visitors but did not resemble a rugby scrum. 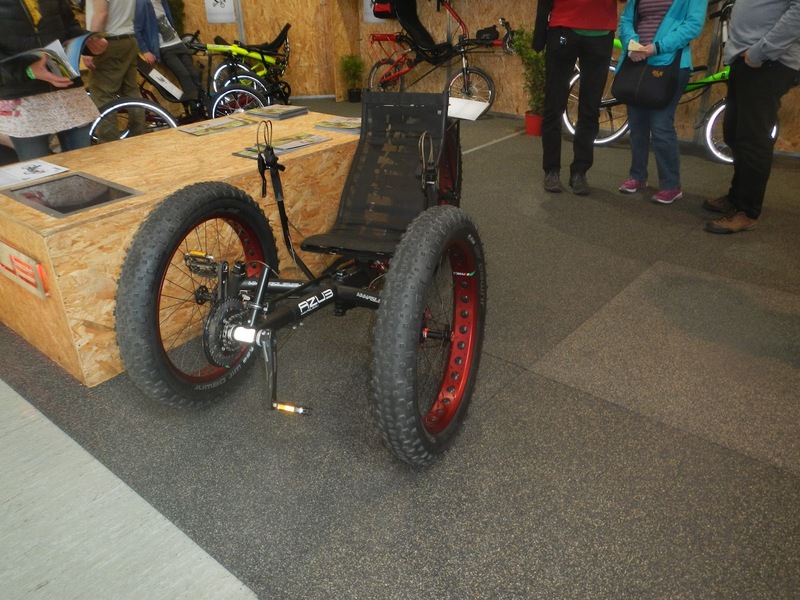 To sum up our impressions fat tyred trikes are definitely in coming, cargo bikes, especially with e-power are now viewed as a serious possibility for deliveries in city centres to reduce air pollution and e-powered bikes and trikes are now mainstream. Carla Cargo build braked trailers with or without electrical power that convert to hand trailers for "last mile" deliveries through a pedestrian zone. 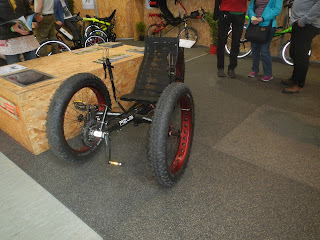 AZUB the Czech trike manufacturer, HP and ICE now offer fat tyre trikes. 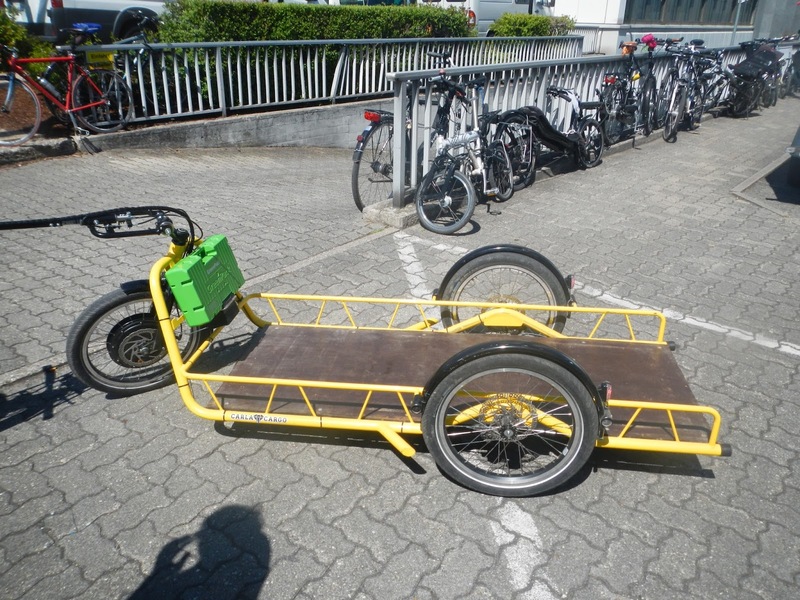 A Carla Cargo powered trailer for inner city use. 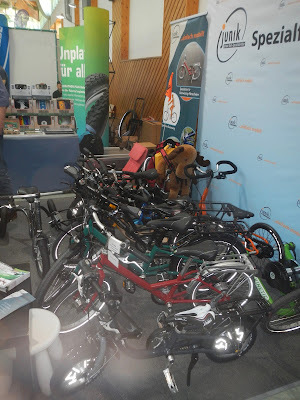 Unfortunately common sense says we cannot buy a recumbent trike or bike as our bike garage is small and will just take two touring bikes and lawn mower. 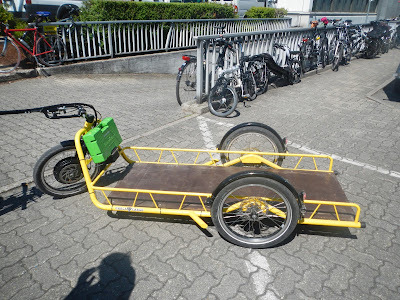 However when I am in day dreaming mode I think a Flevo GreenMachine would a great addition to our bike collective and in slightly more sensible mood a Anthrotech semi-recumbent trike would be easy to get on and off. I think it would be fun to ride as well. Anthrotech appear to no longer have a British agent, so if you want to buy one you will need to arrange transport. 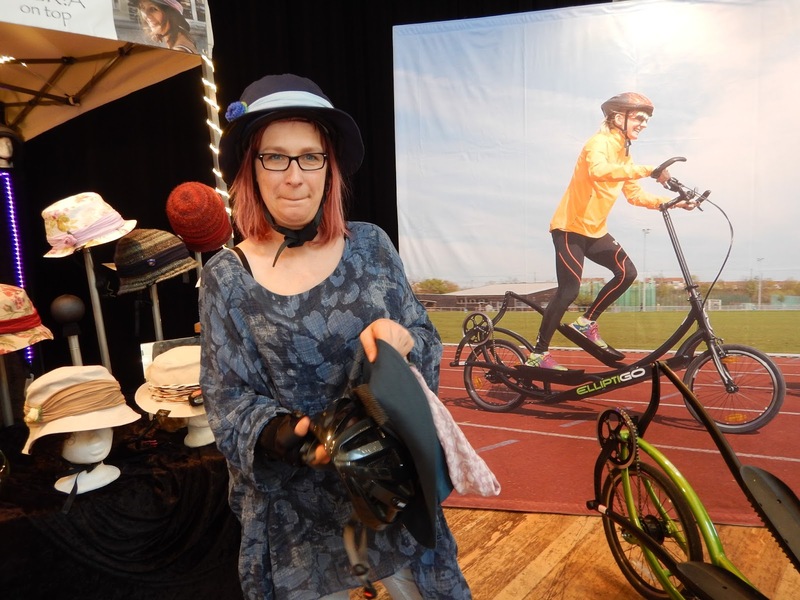 We were interested to find a hat to fit over a cycle helmet on the EVARIA on top stand. They are stylish and manufactured in disabled workshops. You can look cool and help others. A great idea! We found Monkey Mirrors on the HPV parts stand. These clip on the helmet, are stylish and can be swopped over when one crosses the English Channel. It's an interesting idea, but I already have a mirror and will stick by my present mirror which attaches to the arm of my glasses. A head mirror is a capital wheeze. It could save your life, especially in heavy traffic. They are light. You know what's happening on the road behind you. 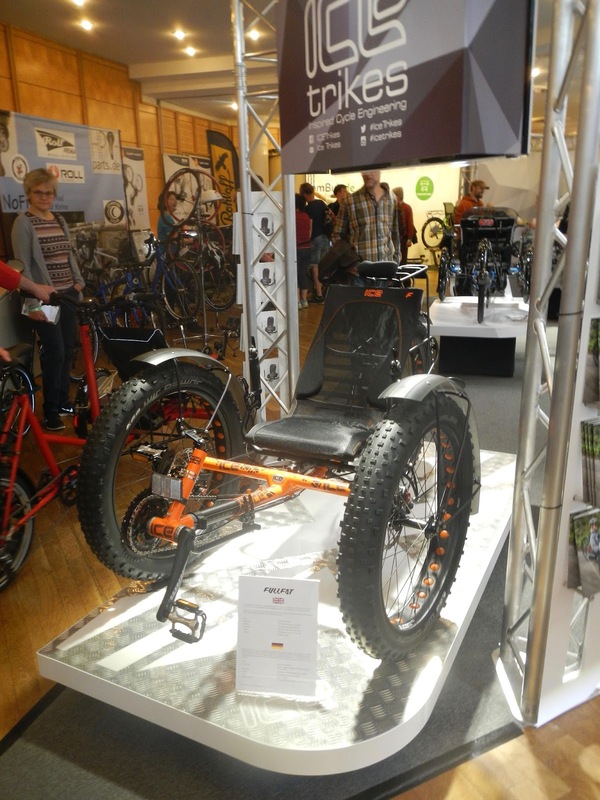 In Hall 2 we were pleased to meet Juliane Neuß who runs Junik, a human powered bicycle manufacturer. She is an expert in the ergonomics of cycling, a book and magazine author and runs an interesting bike shop. Years ago she developed a kit to convert a Brompton folding bike to a recumbent. Junik HPV can modify a steel framed Brompton to take a Shimano 8 speed Nexus hub gear, offers proper touring and commuter bicycles for people of small stature and has developed the Sauseschritt and Sausi-Kid, a scooter with a seat for adults and children. All of the occupants of the various stands (booths) listed above and our fellow Lancastrians on the Advanced Vehicle Design stand that we visited seemed to have a good show and intended to come back next year. If you can organise it it is worthwhile planning to get to SPEZI a little later, but even if you have to queue at 10:00 a visit to SPEZI is still worthwhile.